Welcome to the blog site of the nautical adventures of Bee Weems (BW). 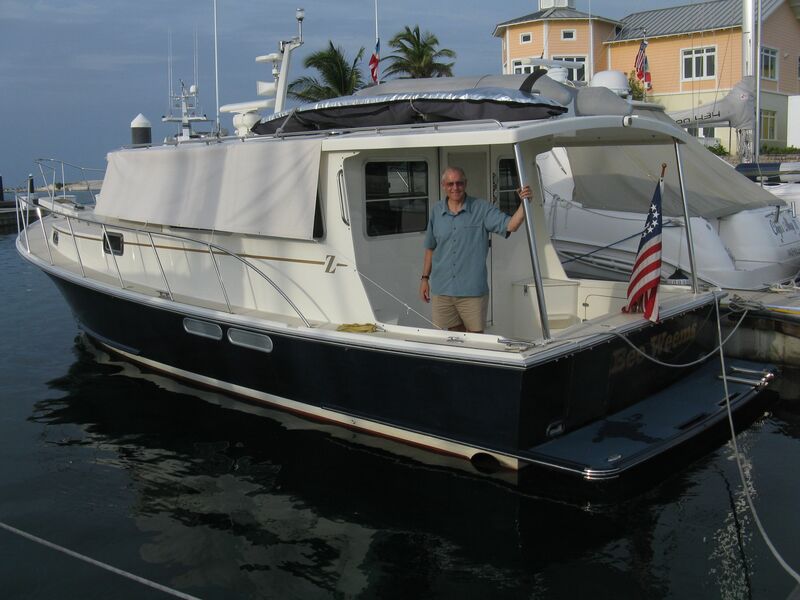 Some of you are familiar with Bee Weems, the Weems and Plath 36 foot yacht owned and operated by the president of Weems and Plath, Peter Trogdon and his dedicated wife, Cathie, chief photographer and author of the Bee Weems blog. As keeper of company and family history records, I have kept some semblance of a blog during our past expeditions but its now official! Weems and Plath has its own blog available through the Weems & Plath website. Because of this new status, I feel my comments must be a bit more representative of the company or at least, I must be more cognizant of a broader audience. I will continue to share my personal impressions of our travels but I will also relay a few navigation and product stories that might appeal to our loyal W&P patrons. You can read about the naming of our Zimmerman lobster boat in other posts on our website. Bee Weems is now 6 years old and has successfully negotiated 6 major adventures in all different climes and locations. Year 1 (2006) she ventured to the Bahamas, Year 2 (2007), New England to Maine, Year 3 (2008), the Hudson River, Erie Canal, Thousand Islands and the Great Lakes. Then BW traversed over land by truck to the Pacific Northwest and the following two years she explored the Broughton Islands in British Columbia, Year 4 (2009), and Southeast Alaska, Year 5 (2010). Then back to the East Coast where she traveled up the Hudson River, Lake Champlain and Montreal in Year 6 (2011), and now, Year 7 (2012) back to the Bahamas for a second visit. This past winter Bee Weems was stored out of water at River Forest Yachting Center, a first class boat yard in Stuart, Florida in readiness for the upcoming crossing to the Exuma Islands in early May. Steve and Gwen Zimmerman took BW on the first leg of the trip from Florida all the way to Georgetown on Great Exuma Cay. Some of you know, that Steve Zimmerman, the builder of BW, and members of his family have been an integral part of BW adventures every year. Not only did he build this beautiful, versatile, seaworthy vessel, but also without his willingness to meet BW either at the start or at the midpoint of BW explorations, these trips would never have been able to take place. Because the travel distances involve many hundreds, sometimes thousands of miles the excursions take anywhere from one to three months round trip. And because Peter is still actively involved in running a business as is Steve, they have worked out a symbiotic relationship that has been a blessing to both. Peter and I dream up where we want to go and accompany BW in one direction and then Steve brings her back or visa versa. The really wonderful part of this relationship is that Steve has an opportunity to experience first hand the boat he builds for customers and understands now at a visceral level the beauty, comfort and efficiency of these custom boats and Peter can develop, test and demonstrate Weems & Plath nautical products aboard his yacht. Peter and I flew out of Baltimore-Washington on a grey, rainy Tuesday morning (May 14th) anticipating the alluring turquoise waters that the Bahama Islands are known for, but as we approached Nassau later that afternoon it was evident that it had been raining there too, and the waters were as grey as the Chesapeake, reflecting the color of the sky. Brief disappointment. When we finally arrived at Emerald Bay Marina where the Zimmerman’s had left BW in ship shape condition and ready for us to embark on the next leg of the trip we were in great spirits aboard BW once again. Before leaving the marina the following morning we visited the charming marina office decorated in a nautical Bahamian flair and were greeted by the familiar site of several Weems and Plath products prominently displayed! Two gimballed brass Yacht Lamps adorned interior posts and a Den Haan Yacht Lamp hung in the stairway to light the way to the second floor. Also, a Bluewater Tide and Time Clock was mounted beneath a series of clocks showing the time in six different time zones around the world. Peter introduced himself to the Marina manager and she was thrilled to meet the owner of the company that provides these instruments.